After a rumored controversy threatened to put a dent in Moonshine and Valentine 結愛 千歲大人的初戀, the show finally premiered and it fleshes out a very intriguing concept right off the bat with a story about a Fox clan that has descended from a planet, not unlike the Earth, and an enduring romance over many lifetimes. 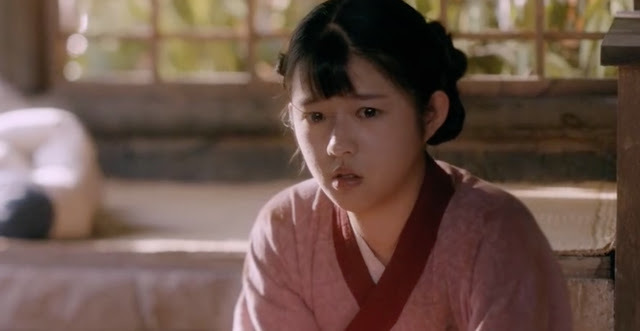 The scene starts out in ancient times with Huiyan's parents discussing if they should or shouldn't marry her off to a strange family. The mom is concerned that Huiyan (He Landou) is too young and that the family is too weird since they offered a big cash gift for Huiyan but didn't ask for anything in return except for her date and time of birth. There was also the added condition that the parents would never see Huiyan again. From the other room, Huiyan looks visibly agitated as she clings on to every word. In the next scene, we can see a veiled Huiyan inside a traditional Chinese wedding carriage. The carriage comes to a halt and she gets off wondering if they have arrived and if so, where. She then hears a man telling her not to ask questions. She stands in the middle of a pebbled path, probably in the middle of the woods, but there's nobody around (Freaky, right?). She is waiting in the room when she hears a voice call out to her. 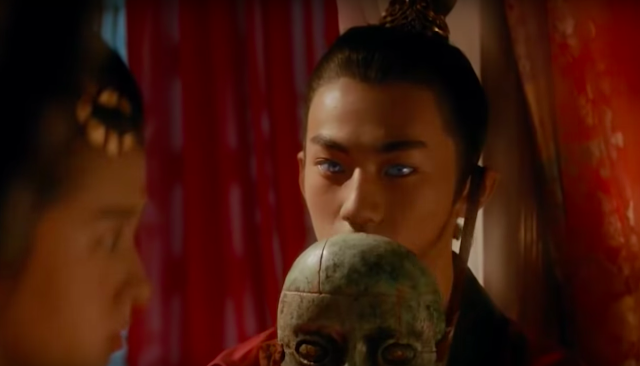 A young man (Liu Qi) wearing a wooden mask comes in and pulls down her veil while apologizing to her. He admits that he is also uncomfortable with what's happening. He explained that his father doesn't want them married yet, but due to customs, they would still need to spend the night together. The next scene is kind of cute actually, the young boy offers Huiyan an apple which she refuses as she insists on going home. He insists on her eating it and says that he'll wait all night if he has to. She finally relents and takes a bite. When the young boy asks why he can't hear her chewing, she has no choice but to actually eat it. She wonders aloud if he really can't see and he takes his mask off to show a pair of eyes that are the oddest shade of blue. He apologizes on behalf of his parents for essentially buying her freedom, but she shrugs it off and says that she's fine with it because her parents got money in return plus she's ugly anyway so her parents are just glad to have her married off. Our sweet boy argues that he can hear from her voice that she's obviously pretty and not ugly. It definitely made her smile and she returned the compliment by saying he's not so bad looking himself (Cute, right?). He also explained that his dad says his blindness will be cured one day but he would only be able to see when the moon shines. The scene shifts to the an older version of them where our hero, Helan Jing (Johnny Huang), attributes his ability to see at night to his wife, Huiyan and then vows that he will continue to find her. We find out later on that this is part of Pipi's (Victoria Song) regular dreams. 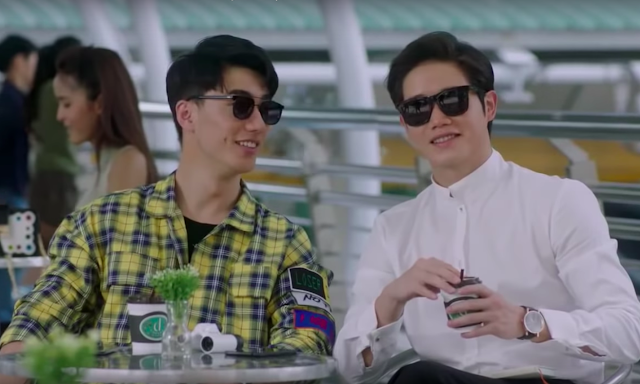 In the next scene, Helan Jing is on a helipad when his two lackeys arrive to confirm that his apartment and documents are in order (Who waits for people on helipads anyway? Haha). Then it jumps to a storybook narration about a planet far away much like the Earth. Similar to our evolution, the aliens were also able to build a civilization. Their scientists predicted that their planet will be destroyed so they had to escape to other planets. One group landed on Earth and called themselves the Fox clan. Men were shocked to see this and ancient literature said that a huge spaceship flew above the western sea. The aliens had white feathers all over their bodies and flew around without wings. The Fox clan eventually adapted to Earth and started to look like humans. 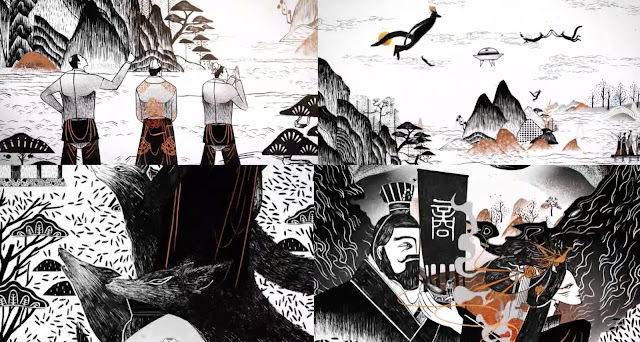 The narrator further explained that the relationship between the humans and the Fox clan has always been strained but one particular government official with a particular interest in the topic compiled all this into a storybook called the Guang Yi Ji. The storybook spread far and wide and then the interest in the foxes turned into fear. As the humans became less friendly, the Fox clan had no choice but to hide their identity from us. Helan Jing arrives at his new house where he is prepped by his two assistants on Guan Pipi's life, family and friends. When it was time to brief him about Guan Pipi's boyfriend, he stopped his assistant and basically said he doesn't want to bother knowing him since he'll be gone from her life soon. As if that wasn't stalker-y enough, he asked his assistant Xiu Xian (the guy with the cute dimple - Li Shen! ), to check her schedule because he wants to see her tomorrow. In the next scene, Guan Pipi tells Tian Xin (Xu Fangyi) that she had "the dream" again, the same dream she had since high school. She and Tian Xin are left wondering what the dream means when they meet up with Guan Pipi's boyfriend, Tao Jialin (Xu Kaicheng). Watching the conversation, I noticed that you wouldn't know that Guan Pipi's the girlfriend since Jialin seems to have more things in common with Tian Xin. She might have felt it too since she faked an excuse to leave the two alone even when she had purposely taken the day off to spend with her boyfriend. Back at work, Pipi is sent away by her co-workers on a coffee run, so she heads to Xiao Ju's (Liu Yongxi) coffee shop to vent. She admits to her friend that she and Jialin seem to be drifting apart. Xiao Ju, being the good friend that she is, tells Pipi to either break up or do something about it other than complain (she's my kind of girl! Haha). The anticipated meeting is now about to happen. Pipi is on the phone with Jialin while Helan Jing is walking towards her while his two assistants looks on. When he calls out to her, she gives him a look which cues the romantic background music for the classic love at first sight moment. She runs to him, but ends up giving him loose change and a pack of nuts that she swiped from Xiao Ju's coffee shop earlier, thinking that he's a beggar. This shocks the two assistants and Helan Jing as well because this is not what they expected. Helan Jing recovers quickly and asks if she could direct him to the subway so she offers to take him instead. On the way, somebody swipes her wallet and she chases him down and onto the streets. The thief then steals a motorcycle and almost gets away but it's a good thing Helan Jing arrives with his car. They chase down the thief until they were able to cut off him off while the thief was checking his loot (lesson - always keep your eyes on the road!). Car wrecked but wallet retrieved, Pipi is grateful and on her way off when Helan Jing offers his business card so she can call him in case she encounters a problem. He doesn't elaborate the kind of problem he can assist her with so it's kind of ambiguous and creepy to say the least. I also have to point out, what is up with Kuan Yong's (Li Jiaming) clothes? It looks more like a women's top or something out of the Victorian era. With the car broken, the trio decide to walk back when they are ambushed by three dogs! 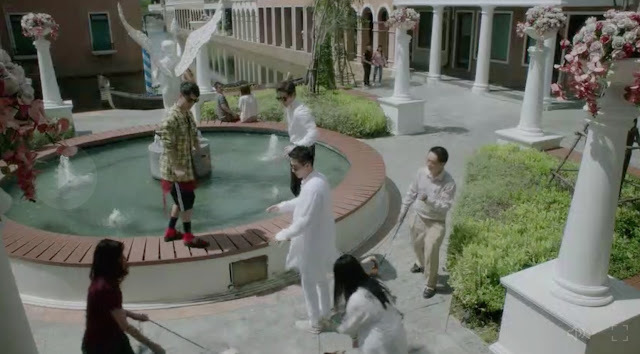 The assistants are so petrified that they stand on the fountain's ledge and leave Helan Jing to the dogs. They recover quickly enough to "save" their master too. I guess the Fox clan has something against dogs - however cute and small? The next scene shows Jialin and Tianxin outside Professor Liao's office waiting to go in. When it was their turn, Tianxin slips past Jialin and goes inside the room without him. Professor Liao and Tianxin discuss opportunities for further studies. The professor encourages her to pursue Stanford and agrees to sign a recommendation letter for her. Upon closer reading, Professor Liao catches the name Tao Jialin and banking on the Professor not knowing her name, she emphasized that it's her, Tao Jialin from Class 3. Professor Liao was rendered more confused upon coming face-to-face with Tianxin's cleavage. We find out later that Tian Xin has never taken any of Professor Liao's class and that she's just a skillful actress. The next scene, Pipi arrives at her parent's barbershop with her mother nagging her about what she's getting Jialin for his birthday. Her mom also asks her to casually drop the idea of marriage especially in front of Jialin's parents. Pipi wants to get Jialin something special but will need to borrow money from her mom for the gift. Her mom declines. The episode ends with He Lan Jing staring at photos of Pipi saying he misses her. He goes on further with an introduction of himself. He says that he's more than 900 years old and he's the Right Priest of the Fox clan. He says he's willing to do anything for her (we assume he's referring to Pipi since she's the reincarnation of Huiyan), even give up his life which for him would be a welcome reprieve. First Impressions: I enjoyed the side characters Xiu Xian and Kuan Yong and their tireless banter the most. You would think for somebody who has lived hundreds of years, they would have been bored with the world but I found them funny especially during the car chase and that incident with the dogs where they left He Lan Jing. People have criticized Victoria Song for her bad acting in the past. It's my first time watching her in a drama and I can see some instances of that where it could be better but I wouldn't say it is bad at all. 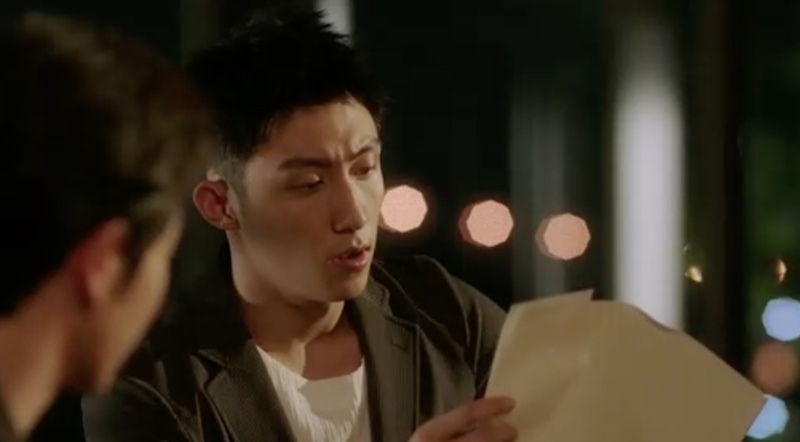 Huang Jingyu, on the other hand, seems to have just one face (see last photo - a handsome face). Haha I hear good things about him, but maybe because he's supposed to be blind but the scene does not call for much emotional acting yet so we'll see. I hate Jialin because I feel he is being a jerk to Pipi and is only thinking about himself. He is the type of person who would do anything to achieve his dreams. If I were Pipi, I'd pass on that. I would definitely try to squeeze this into my schedule and catch up on what's happening. This drama is so funny it made me burst out laughing a few times. But at the same time the sad moments really get me and the romantic moments made me swooooon. Definitely a rare gem! I am really loving it. Victoria Song has improved in acting and the male lead, for me, is gorgeous, his eyes are magnetico. Totally recommend it! I love this drama... the story is so interesting. 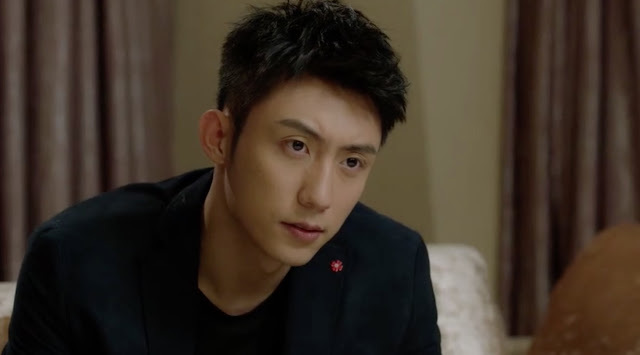 Vic acting is good in this drama but the most i love is Huang Jingyu, he is so freaking handsome and his acting also so cool.. and those two boys are adorable too. Anyone know the song in car chase scene? I also want to know the name of the song which played during the car chase scene please! I just watched this week episodes 9-12. The story is getting interesting. where did you watch episode 9-12? Thank you for the recap. The scene with the dogs, was meant to be like a "fox hunt." They are saying that the dogs could see their true nature as foxes.